As a child, the starting sound of a cake mixer being roared into action would lure me into the kitchen. My father gave me a spatula, and I would scrap the sides and the bottom of the bowl after each ingredient was added. Behind his back, I would lick the spatula and the spoon rest. The best taste was the creaming of the sugar and butter. The taste test would temporarily cease when the eggs were added. When the flour was added, the taste test would restart. After pouring the batter into the pan and placing it in the oven, my father would allow me to lick the bowl and the mixer’s beaters. 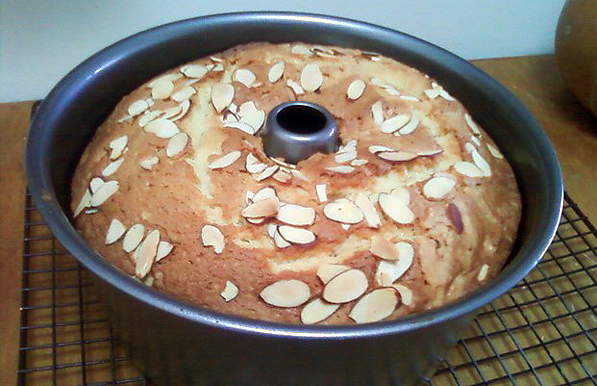 When I made this Buttermilk Pound Cake this past weekend, I recalled those taste tests as a child. Today, as an adult, there are no restrictions to the amount of cake batter I consume. Instead of scooping the batter with fingers or licking the spoon rest, a clean spoon is used each time I want a taste. I’m usually in a sugar-high state of mind by the time the cake goes into the oven. If the boyfriend caught me, he would remind me how unhealthy it is to eat cake batter because of the raw eggs. Some type of regulation is needed. I treat myself to the batter, because cakes are rarely made in this household of only two. Besides, when the cake was done and cooling on the rack, I went outside to run for 30 minutes, in freezing temperatures. Such sweet indulgences of childhood reminiscences are well deserved.